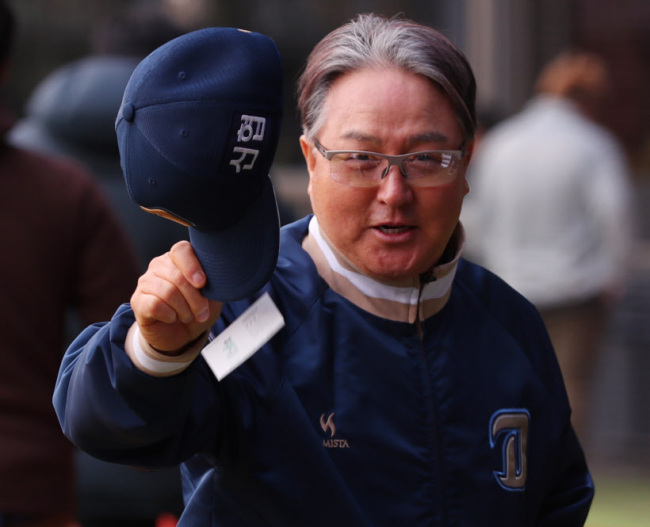 The last-place club in the top South Korean baseball league has replaced its manager. The NC Dinos, mired in 10th place in the Korea Baseball Organization, announced late Sunday that Kim Kyung-moon will be replaced by general manager Yoo Young-joon. Kim will serve in an advisory role for the club, though his specific responsibilities haven't been defined. Kim, who has 896 wins, 774 losses and 30 ties in his career, has been the only manager for the Dinos, which joined the KBO in 2013. This was the first managerial change in the KBO in 2018. Yoo will come down from the front office to the dugout to serve as the interim manager for the rest of the season. Kim Jong-moon, head of the team's public relations, will double as the interim general manager. The Dinos were ambiguous about the exact nature of the managerial move, using the term "leadership change" instead of dismissal or resignation. The club only said the decision was reached through a mutual agreement. The Dinos made the announcement soon after an 8-7 loss to the visiting Samsung Lions at Masan Stadium in Changwon, 400 kilometers southeast of Seoul. It was their third straight loss and their eighth in the past 10 games. The Dinos are the worst club in the KBO this year at 20-39, 5.5 games back of the ninth-place Lotte Giants. This has been a stunning fall from grace for the sixth-year franchise, which has made the postseason the past four years. The Dinos ranked seventh in their inaugural season in 2013, and finished third in 2014 and 2015. They ranked second in the regular season in 2016 and reached the Korean Series for the first time, falling to the Doosan Bears in four straight. They ended the 2017 regular season in fourth place and bowed out of the second round of the postseason. With the Dinos on course for the worst season in their history, Kim, 59, took the fall moments after managing his 1,700th career game. Yoo, 55, is a former semi-pro catcher who had been a scout for the Dinos before taking the GM job in January 2017. He has managed three different high school teams but has zero coaching experience in pro ball. Yoo said Monday the key for him is to bring stability to the club. "There won't be anything different," he said. "I think the players could be shaken up by this change, and my primary goal is to make sure we put a stable team on the field." Dinos President Hwang Soon-hyun paid tribute to Kim for carrying the young franchise this far.